The Awetest Recorder is a simple Firefox plugin that can be found at https://addons.mozilla.org/en-US/firefox/addon/awetest-recorder/. 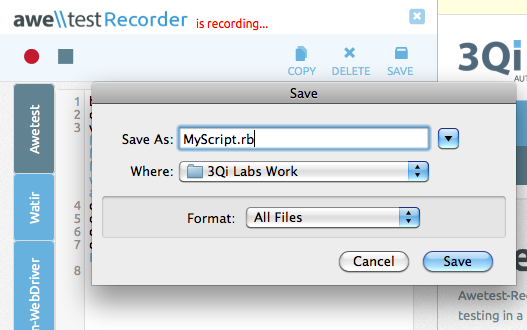 Once enabled, the Awetest Recorder will start converting your interactions into script within the recorder. The Awetest Recorder provides support for multiple different platforms, including Awetest, Watir, Selenium-WebDriver, and Cucumber. 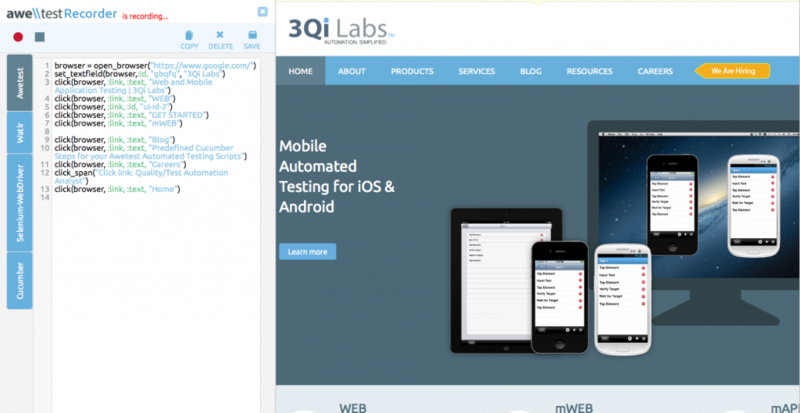 This form of integration gives you the ability to record automated testing scripts simultaneously for each platform. The scripts can be saved and exported to any of their corresponding platforms. 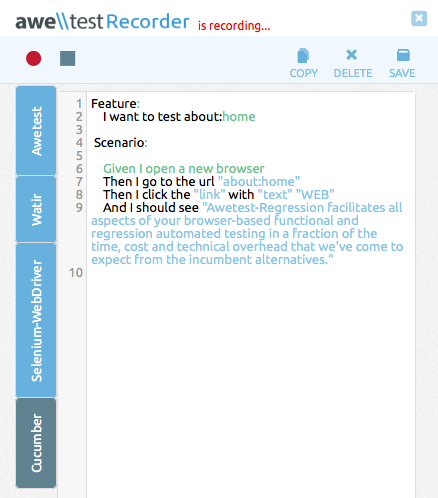 As a result of this, any script recorded with the Awetest Recorder can be uploaded directly into your own Awetest test cases, allowing you to go from recording to testing as quick as possible. The Awetest Recorder couldn’t be any easier to use. After clicking on the Awetest backslashes to enable recording, you can right click on the same button to pull up the interface. 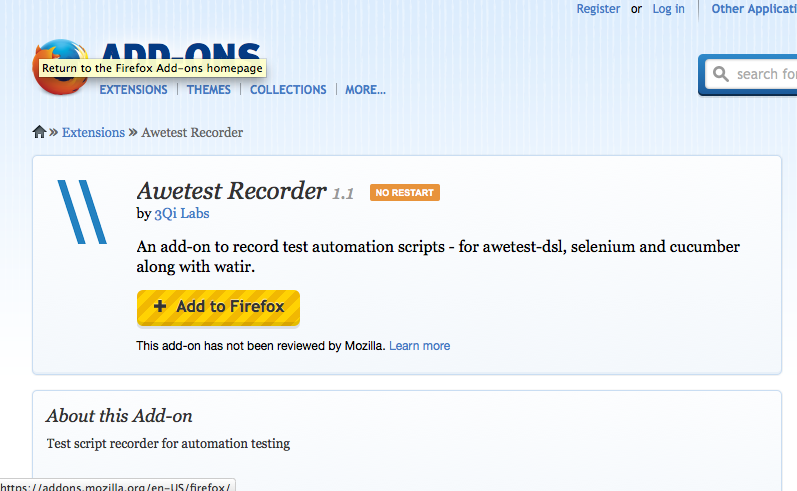 The recorder will read “is recording…” next to the Awetest logo, as seen below. Once recording, your actions (such as clicking on a link, entering text, etc.) are logged as scripts that can be executed through the variety of languages that the scripts are recorded in. As mentioned earlier, saving the script is as simple as hitting the SAVE button in the top right of the recorder, allowing you to use the code for anything from identifying the DOM elements to actually executing the script. The Awetest Recorder is a multifaceted tool that we know will provide value as you integrate it into your automation process. We’ve shown you the basics; now get creative and let us know how you’ve utilized the Awetest Recorder!